As of 2013, reported offerings include: baked goods, cheese, crafts, flowers, eggs, herbs, vegetables, meat, plants, prepared foods, trees, and fruits. Quality fresh, local, chemical free & sustainably grown vegetables & herbs. 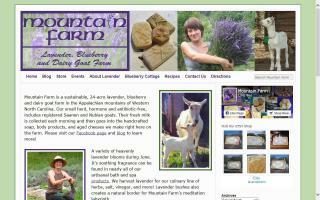 We are a small-scale but diversified dairy goat farm where we also produce in-season produce and berries. We produce value-added products as well, such as goats' milk and cheeses, jellies, baked goods, honey as available, crafts, goats' milk soaps, hops, bloody butcher cornmeal, tours and workshops and more. Call us for info and/or check pricing and availability. We sell here on-farm and also on Saturdays at the Yancey Farmers' Market. Call before visiting the farm to make sure we are here since we are a working farm.